“The Invasion has begun! Flying saucers are abducting innocent people off the streets and returning them corrupted, and changed. It has become impossible to tell apart harmless civilians from vile alien scum. Sounds awesome right!!??!! Kind of has a “The Thing” vibe going for it, which is always a plus in my book. It also features Emily’s Clean and functional art style which gives the game a retro 50’s sci-fi vibe, which aids in the immersion. Players begin by receiving a secret role card. That card will inform the player as to which team they are playing for at the start, either Alien or Human, BUT!! there will be various condition cards sprinkled throughout the deck that can alter the players original state. That means that one round you could be a human, well on your way to aquiring the supplies necessary to mass produce the vaccine, but then BOOM!!! You’re infected, and are now squadding up with the Alien’s. 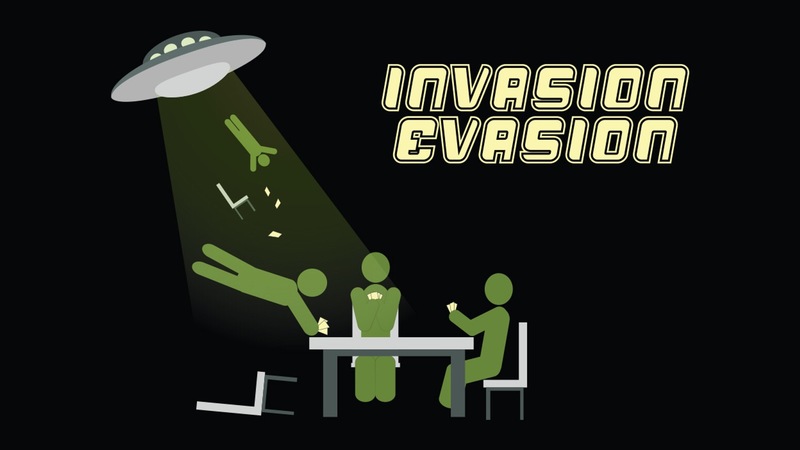 In fact, it is fully possible for all the players to transition back and forth between Human and Alien multiple times during the course of a game, only adding to the tension. 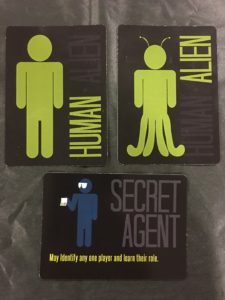 A typical role card (Human Being) and two status cards, all three should be kept secret by the player. A Role card highlighting a character with a special ability, in this instance, the Secret Agent may identify and learn the role of any one player. 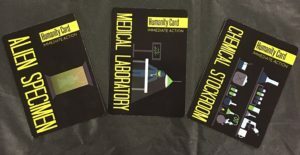 Depending on your current state, the objective is to acquire either three “Humanity Cards”, or three “Doomsday Cards”. This is where the teamwork aspect comes into play, as these cards can be passed freely between the players at any time. Conversely, they can also be held hostage by a player, preventing the opposing team from collecting all the necessary components. Aiding the cause of both Human and Alien alike, are a host of adventure cards. 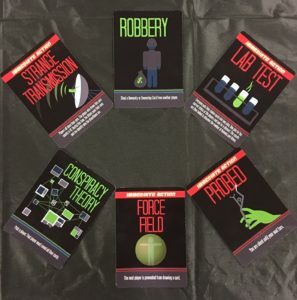 These include cards such as the “Strange Transmission”, which allows the aliens to learn each other’s identities secretly, the “Suspended Animation” card, which prevents the target player from drawing or playing cards for two turns, or the “Nuclear Option” card(s) which allow the Humans to commit the ultimate sacrifice for the rest of the planet by not only killing themselves, but the aliens as well. Adventure Cards: (Bottom Left) the three types of Humanity Cards that the humans will need to collect to win. (Below Right) The Alien counterparts, known as Doomsday cards. (Above) an assortment of Adventure Cards, these cards effect gameplay and can change player status. They also show off Emily’s retro futuristic art vibe. This game never lets you feel safe for a second, and that’s a very good thing. With players constantly shifting between Alien and Human you can never be sure if the “teammate” you just handed over a valuable resource card to is currently working for the other side, or if they will be in the near future. Conversely you could be 2/3 of your way to victory, and just happen to pull an infection card from the deck, and then all your strategic planning is for naught. Keep in mind though, not only are you having these paranoid thoughts about everyone at the table, but they are having them of you as well!!! 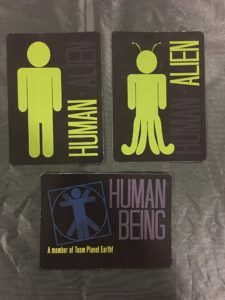 Does your hoarding of the Humanity cards mean you are human, hoping to keep the supplies out of Alien hands? Or does it mean that you are doing the exact opposite!!??!! In the end it really boils down to “Who do you want, or more importantly, NEED to trust”? On the podcast I described this game as “elegant”, and after many more playthroughs, I feel that word is as justified now as it was then. It is elegant in its simplicity. There is no fluff, every card means something to the game, and they all interact with each other perfectly. You can tell that Kyle and Emily put a lot of thought and effort into this endeavor. I can only guess at how many times they playtested it to refine the card abilities. It truly is a credit to independent game design, and only goes to show that you don’t have to have a huge budget, hundreds of employees, high priced miniatures, giant game boards, or fancy packaging to have a truly engaging game. 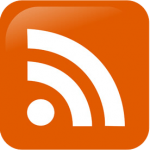 All you need is a good idea, and the work eithic to turn that idea into a reality. This game is easily a 10 out of 10. 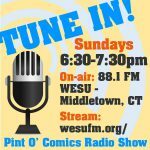 You can visit their website at www.scatterbrainedcreations.com, where Invasion Evasion is $24.99 on their E-Shop, and while you are at it, check out Emily’s children’s book “A Grumpy Situation” where a Giraffe named Grumpy learns the importance of friendship.